On the west coast of Scotland, in the heart of Robert Burns country, this privately owned bed and breakfast offers free Wi-Fi and parking and is well known for its good food and Scottish hospitality. 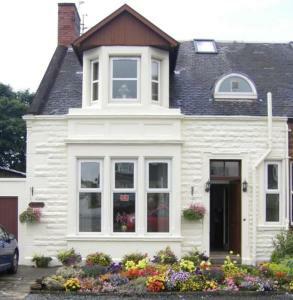 Failte Bed and Breakfast is located on the A79, only a 5-minute drive from Glasgow Prestwick Airport. Newton-on-Ayr Railway Station is only 2 minutes' walk away, with regular trains running to and from the airport. There is also a bus stop outside Failte with regular services to Glasgow's city centre. The restaurants, pubs and shops of Ayr's town centre are just a 15-minute walk away. Ayr Racecourse and Northfield Bowling Complex are also both within easy walking distance and the area is also excellent for golf and fishing. All of the rooms have hairdryers, TVs with Freeview digital channels, toiletries, tea/coffee making facilities and biscuits. 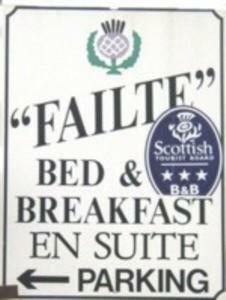 A full cooked Scottish breakfast or a lighter continental breakfast is included in the price.